MOSCOW, Russia -- Why have so many Russian citizens seemingly been so cavalier about the dismemberment of Ukraine, a sovereign state that majorities of Russia’s population had long viewed quite favorably? Share of Russians supporting different borders for Ukraine. New survey evidence indicates that this is not so much a product of a surge in Russian nationalism, which has actually remained rather stable since the pre-crisis period. Instead, it has much more to do with a stunningly widespread Russian view that Ukraine as it has existed since 1991 is simply not legitimate as a state within its present borders and with its present government. The findings come from a nationally representative survey of 1,200 adult respondents conducted during Nov. 5-18, 2014, by Russia’s ROMIR survey agency as part of the University of Oslo’s New Russian Nationalism (NEORUSS) project, led by principal investigators Pål Kolstø and Helge Blakkisrud. 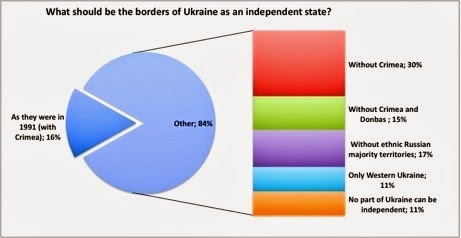 As the figure above illustrates, given a finite set of options, only 16 percent of the population answered in line with international law by affirming Ukraine’s borders as they have existed since 1991 (and also for much of the Soviet period). In all, nearly 84 percent of respondents supported reducing Ukraine’s territory. Russians also clearly see Ukraine’s current leadership as illegitimate. Overwhelmingly, one sees that Russians tend to deny not only that Ukraine’s current leaders were freely elected, but also that these leaders have any legal standing at all. Rather than seeing Ukraine’s government as representing its people, they see it as merely a puppet of Western powers. Russia’s view of what is happening inside Ukraine seems to boil down to the notion that Ukraine is a failed state, with the roots of the conflict lying mostly in Ukraine’s own dysfunctionality. The typical Russian citizen tended to see the conflict more as a conflict between political forces internal to Ukraine, or as a struggle between eastern and western Ukraine, than as a battle between different countries, civilizations, or transnational corporations. That said, we notice that this typical Russian does not rule out a role for any of these sorts of forces, instead choosing responses that indicate uncertainty. Perhaps because so many Russians see Ukraine as a basket case, a strong plurality expressed opposition to any kind of Russian intervention in its affairs. Asked what Russia should do and given a list of options, a whole 44 percent replied “nothing,” and 3 percent even declared that Russia should help Ukraine join the European Union. Only 27 percent thought Russia should be involved in helping Ukraine elect a new pro-Russian government, a measly 4 percent wanted to help it join the Russian-led Eurasian Union, and just 12 percent thought Russia should actively try to divide it up. A 10th of the survey respondents said the question was too difficult to answer. In response to a separate question, a large majority also thought Russia should not hinder Ukraine’s efforts to join the European Union. Consistent with this interpretation, while most Russians thought Ukraine should be much smaller than it would be even without Crimea, only a quarter or less of the population is found to think that the Donbas (where the Russian-backed insurgency is most active) should actually become part of Russia — about the same as supported Russia’s reacquisition of Alaska in the same survey! While a quarter desiring such things is still worrisome for the international community, this is far from a massive groundswell of nationalist sentiment for military expansionism. While analysis of this survey is ongoing, including preparations for a multi-contributor book with Edinburgh University Press tentatively titled “The New Russian Nationalism” under the editorship of Kolstø and Blakkisrud, the findings presented here clearly indicate that Russian citizens have come to share a very dim view of Ukraine as a state. This is surely a strong enabling condition for Russia’s annexation of some Ukrainian territory (Crimea) and its only thinly veiled promotion of further Ukrainian territorial dismemberment. That is, even as most Russians tend to think Russia should not interfere in Ukrainian affairs and should not take more territory than Crimea, their view of Ukraine as a failed state arguably predisposes them to believe that most of the misfortunes befalling Ukraine (including ones initiated or promoted by the Kremlin) are Ukraine’s own fault. Clearly these views have been strongly shaped by Russian mass media, though exactly how much influence the media have had remains to be adequately explored. In any case, the resulting patterns of public opinion quite adequately suit Kremlin purposes and could well complicate eventual resolution of the conflict.